From 4 April 2016, freighters must pay even more attention if they use an on-board unit (OBU) for toll declaration in the HU-GO distance-based electronic toll system. On the basis of the statutory authorisation, a database of invalidated on-board units is to be introduced, which will include OBUs that cannot be used for proper operation e.g. due to insufficient funds in the account. The system of penalties will not change, and if you pay a bit more attention, it is still very simple to avoid toll fines. NTPS Plc, in compliance with its statutory obligation, will introduce from 4 April 2016 a database of invalidated on-board units, which is relevant for freight forwarders using OBU, but not for those using route tickets. The on-board unit is registered when, based on the GPS data forwarded by the OBU, the current HU-GO balance as registered in the system is not enough to cover the costs of using any further unit tolled section with the same vehicle parameters (number of axles, environmental category), i.e. when the balance runs out. Users are promptly notified via e-mail to their e-mail registered in the customer service website when they are registered in the invalidated OBU database. This notification does not automatically imply penalty, provided that the you refrain from using further toll sections, or top up your HU-GO balance, or pay for road use in advance (e.g. by purchasing a route ticket). You can no longer use your invalidated on-board unit for toll declaration and, consequently, for obtaining road-use authorization for your cargo vehicle using the OBU for declaration. Also, the invalidated OBU and the registration number rendered to it may not be disconnected before the OBU is truck off the list. In order for the cargo vehicle to continue using the toll road network lawfully, please top up your balance using your bank card at the hu-go.hu website, through our smart phone application or at a reseller, or purchase a route ticket for the remaining section(s). We suggest that you top up your balance with at least HUF 5,000. If you top up your HU-GO balance via wire transfer, please take the transaction processing time into consideration. For this reason, this method is not suitable for allowing the cargo vehicle to continue its journey without stopping. In this case, in order to avoid the penalty, it is a good idea to buy a route ticket. Your on-board unit will be removed from the database of invalidated devices as soon as the funds appear on your HU-GO account. Users receive a notification via e-mail of the removal. After this, you can use the OBU for toll declaration again without any further obligation. After internal testing, this new IT development required effective cooperation from freight forwarding trade associations, freight companies, toll declaration operators and the Hungarian Public Road Non-profit Ltd. Due to this high level of partner participation, the second testing phase was successfully completed in May 2015 and, after extensive consultations conducted with the legislator Ministry of National Development and the Police as the authority sanctioning unauthorized road use in the e-toll system, on 15 July the new function was made available to companies registered in the HU-GO system. The fine alert function sends a warning to the email addresses of users registered in the HU-GO system if the control system detects or assumes illegal road use. It is important to note that due to requirements for legal compliance, the alert system does not change the method of imposing fines and all data related to unauthorized road use are still transmitted to the Authority in a closed control system. The fine alert function is available to all users registered in the HU-GO system regardless whether they fulfil their toll payment obligation by purchasing route tickets or using an on-board unit. By default, the fine alert function is inactive. To use this function, the registered user must first activate it. When paying the toll through your on-board unit, before you begin your journey please check whether the unit is turned on, functions correctly, is rendered to the relevant vehicle, and the available balance is sufficient for your journey. 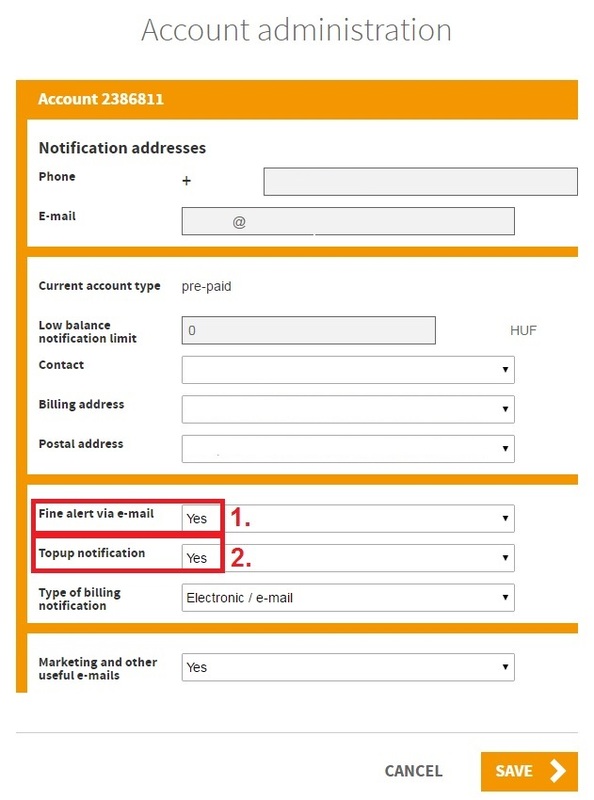 It is reasonable to set the low balance alert function in the user profile at a level to allow the user sufficient time and opportunity after reading the e-mail alert to top up the balance. A lot of OBU users do not set a low balance alert and there is a significant number of users who set this threshold at a level around HUF 15,000. This does not leave much chance for the user to react because, for instance, in the case of a modern four-axle cargo vehicle (J4, environmental protection category A), this amount would hardly allow the driver to cover the Budapest-Röszke route on the M5 motorway. When registering an OBU or planning a route with route tickets, make sure you enter the vehicle’s registration number and the belonging country code correctly, as the latter, in addition to the plate number, is the other important parameter for the identification of your vehicle. These data cannot be corrected in the HU-GO system after the penalty has been imposed. Enter the correct number of axles when you attach or detach a trailer. For example, if you attach a trailer to a two-axle vehicle and now travel with four axles, you must change the J2 number of axles to J4; if you detach the trailer, you must reset the data to J2. If the number of axles is set incorrectly, it may result in an administrative fine. The number of axles must be set in the system before you begin your journey. To avoid successive penalties caused by user errors, the activation of the alert function is recommended. The alert function sends a warning to the email address of the user registered in the HU-GO system if the control system detects or assumes unauthorized road use. It is important to note that due to legal requirements the alert system does not affect the process of imposing fines, and all data related to unauthorized road use are transferred to the authority in a closed control system. The alert function is available to all users registered in the HU-GO system, regardless whether they fulfil their toll payment obligation by purchasing route tickets or using an on-board unit. By default, the alert function is inactive. To use this function, the registered user must first activate it. 1. In which case does the system send a fine alert? The fine alert function sends a warning to the email address of the user registered in the HU-GO system if the control system detects or assumes unauthorized road use. In other words, when a HU-GO tolled vehicle passes under the control gate or next to a mobile data collecting car and it is established during the control that, for some reason (wrong number of axles set, insufficient funds, etc. ), the specific vehicle has no valid road use authorization. By default, the fine alert function is inactive. To use this function, the registered user must first activate it, which is recommended to everyone. 2. Can I avoid paying the fine by purchasing a ticket (or topping up my balance) immediately after the fine alert is received? Due to legal compliance reasons, the alert system does not change the rules governing fines. The data related to unauthorised road use are thus forwarded to the Authority in a private control system. In other words, while the fine related to the notification cannot be avoided by road users, they can avoid further and higher amounts of fines by rectifying their erroneous or deficient user settings on the basis of the information in the notification. In the event of unauthorised road use, the relevant legislation takes into account the duration of unauthorised use, determining the amount of the fine according to three time bands. For further details, see: Penalty. 3. In which case does the system send a low balance notification? The system sends a low balance notification if the balance of the topped-up balance in the HU-GO system falls below the predefined amount upon the toll payment corresponding to the toll declaration method (OBU or route ticket). The registered user is advised to set the low balance notification function for its current account in its HU-GO profile with a realistic safety margin corresponding to its road use. 4. In which case does the system send a notification about the registration of on-board units with insufficient funds? The on-board unit is registered when, based on the GPS data forwarded by the OBU, the current HU-GO balance as registered in the system is not enough to cover the costs of using the relevant unit tolled section with the same vehicle parameters (number of axles, environmental category), i.e. when the balance runs out. Thus, the notification does not mean that the declaration and financial settlement of the specific unit tolled section were successfully completed; it only warns that road use is already unlawful and there are no funds to cover the costs of further unit tolled sections. 5. Will I not be fined if I stop immediately after receiving a ‘low balance’ alert? If you stop using the road, the registration of your on-board unit in the register of on-board units short of funds does not automatically entail a fine. In order to lawfully continue using the toll road network, you must take appropriate action by topping up your balance or buying a route ticket. If you fail to take the appropriate action after you have received the alert yet continue using the road, you should expect a fine whose amount may significantly increase in proportion with the duration of unauthorised road use and the distance covered. In the event of unauthorised road use, the relevant legislation takes into account the duration of unauthorised use, determining the amount of the fine according to three time bands. It enables road users to rectify shortly after the error is detected and thus to avoid payment of a higher fine. For further details, see: Penalty. 6. Can I avoid the fine by topping up my balance or buying a route ticket immediately after the ‘low balance’ alert? Yes, in that case, the fine can be avoided. However, if you fail to top up your balance or purchase a route ticket, and yet continue using the road, as described above, you should expect a fine whose amount may significantly increase in proportion with the duration of unauthorised road use and the distance covered. For details concerning the fines and the calculation of fine amounts, please visit: Penalty. 7. Do I always get the notification at the unit tolled section where my balance is insufficient to pay for road use? The notification about the OBU being registered in the database of invalidated on-board units is immediately sent when the system detects that the balance on the user’s account in the HU-GO system does not cover road use for the unit tolled section that has just been declared. 8. What initial unit tolled section do I need to specify to initiate my purchase of the route ticket? As route planning with a route ticket does not allow a specific unit tolled section designated as the starting point, it is definitely best to use an exact address (or GPS coordinates, or logistics centre or border crossing checkpoint) passed before the notification was received. If uncertain, users should contact the Call Center of NPTS and request assistance to determine the starting point.